Remove the gearshift link arm (1) from the gearshift shaft. mark the gearshift shaft head at which the gearshift link arm slit set for correct reinstallation. Remove the speed sensor (2). 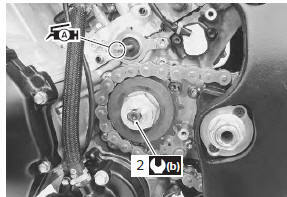 Remove the engine sprocket cover (3). 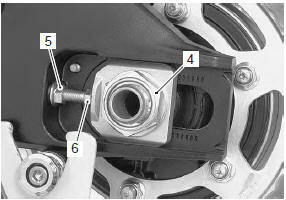 Loosen the rear axle nut (4) and left and right chain adjuster lock-nuts (5). 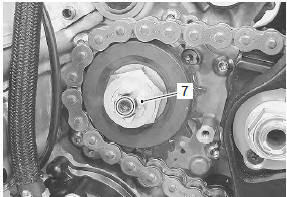 Loosen the chain adjusters (6) to provide additional chain slack. Remove the speed sensor rotor (7) by removing its bolt while depressing the rear brake pedal. Remove the engine sprocket nut (8) while depressing the rear brake pedal. 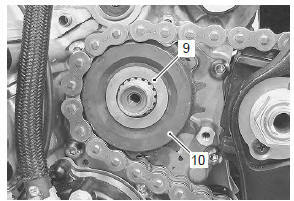 Remove the engine sprocket (10). apply thread lock to the driveshaft. 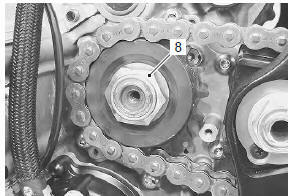 Tighten the engine sprocket nut (1) to the specified torque. 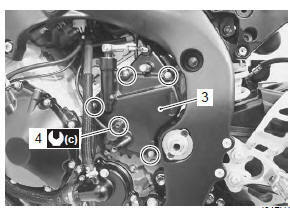 Tighten the speed sensor rotor bolt (2) to the specified torque. Before installing the engine sprocket cover, apply a small quantity of grease to the clutch push rod. 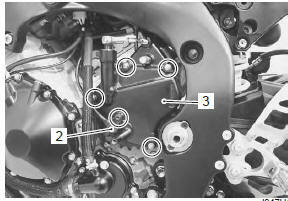 Install the engine sprocket cover (3). Tighten the speed sensor mounting bolt (4) to the specified torque. 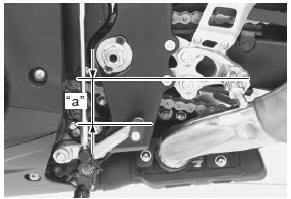 Fit the gearshift link arm to the gearshift shaft so that the gearshift lever is located at height “a” below the footrest. Adjust the drive chain slack. 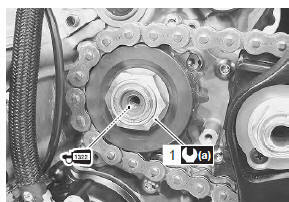 Refer to “drive chain inspection and adjustment” in section 0b (page 0b- 14).